German President Frank-Walter Steinmeier has had his stay in Ethiopia extended after defects were found on his government plane. It’s the second time his plane has had trouble in Ethiopia as well as a few other countries. His flight onboard the Airbus A340 was originally scheduled to depart Addis Ababa for the German capital at 12.30pm CET (11.30am GMT) on Wednesday. However, a technical issue, found prior to takeoff, left ground crew scrambling to repair the problem, according to German tabloid, Bild. A source from the presidential office told the paper that the delay was due to a “compressed air problem,” but could be remedied at the airport in Addis Ababa. Steinmeier, along with the 55-person delegation that has accompanied him on his trip, returned to their hotel while work got underway. During his stay in the African country, Steinmeier met with Ethiopian President Sahle-Work Zewde and Prime Minister Abiy Ahmed, discussing policy, cultural, and development issues. It’s not the first time Steinmeier has been grounded in Ethiopia, or indeed while on official business. 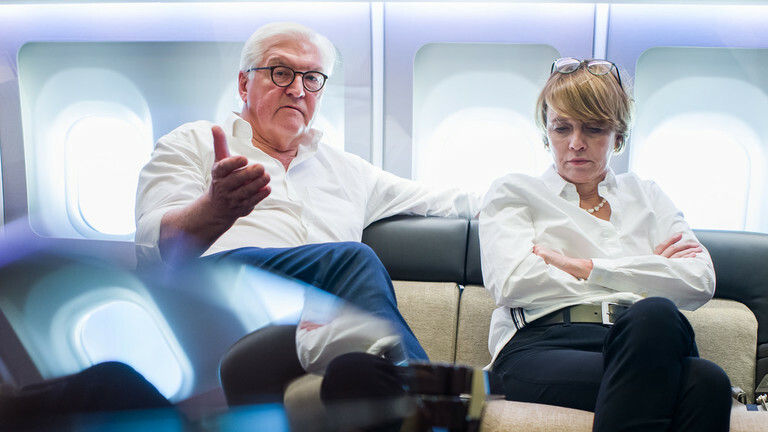 On a previous trip to the country in 2014, while serving as Germany’s Foreign Minister, Steinmeier was delayed from returning to Germany due to a burst tire on his plane. Other occasions which have left him waiting for plane repairs included a six hour delay at a provincial Chinese airport, a broken cockpit window in Latvia, and an unexpected layover in Vienna after the plane he was taking to a 2006 EU-Latin America summit experienced a sudden drop in air pressure.